Early in the discussion, Bartiromo asked Thiel – who famously opened for Trump at the Republican National Convention – what he thought about Trump’s performance. In response, he explained that he’s extremely happy with the president’s performance during his first year in office. While the media has been hyperfixated on the latest leak from the Russia probe, Trump has quietly been slashing regulations and questioning orthodoxies like the economic benefits of free trade. “That’s why, if he runs again, he will be reelected,” Thiel said. “The one thing that I liked about Trump and still very much like about him is a willingness to ask questions and to reframe the debate and not be bound by these strictures. Later in the conversation, Bartiromo asked Thiel about the “Gawker situation.” Thiel, who sounded uncharacteristically willing to discuss an episode about which he has been famously reticent, explained that Gawker’s argument in its own defense was, in reality, an insult to journalism. Thiel said that just because Gawker billed itself as a news site doesn’t automatically extend first amendment protections to everything it publishes. 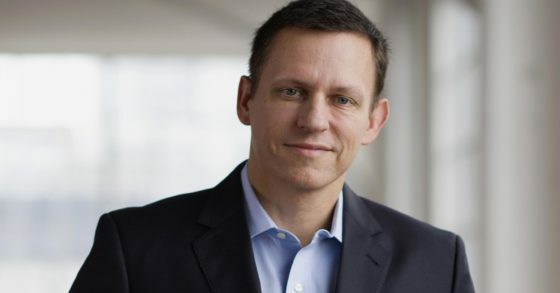 The Silicon Valley billionaire then added that Peter Navarro has sold 1 million copies of his book “Zero To One” in China vs. 40,000 in India, which Thiel says is one way to show how one country is thinking about entrepreneurship versus the other. Intriguingly, amid all the hype and anxiety surrounding investment, Thiel explained why, as an investor, he wasn’t particularly interested in artificial intelligence: because of its bad reputation. Bartiromo then steered the conversation toward bitcoin, and mentioned that, the last time she had spoken to Thiel, that he had expressed reservations about a lot of cryptocurrencies, but was optimistic about the long-term prospects of bitcoin. Thiel explained that he’s owned bitcoin for a long time, and has been consistently bullish. Though he doubts it’ll ever be successful as a medium for payments, Thiel believes bitcoin could endure as a store of value that, much like gold, could serve as a hedge against inflation. “The technology that people like to talk about is the blockchain technology, and I’m somewhat skeptical about how that translates into good investments, but the one use-case of cryptocurrency as a store of value may actually have quite a bit of a ways to go. I would be long bitcoin and neutral to skeptical of just about everything else at this point, with a few possible exceptions. At the very least, both Wall Street and Silicon Valley were both late to the bitcoin party. While this isn’t a reason to be bullish in and of itself, it’s definitely a factor worth considering. And while there are risks surrounding the influence that miners exert, as well as the unraveling of privacy protections. But, Thiel says, there will likely be only one online equivalent to gold…and right now, bitcoin is the only crypto product that fits that bill. Kimmel About To Lose His Whole Show After Foul Clip Comes Out He Thought Was Gone!